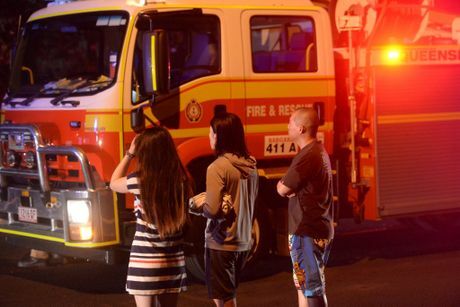 Bundaberg backpacker on fire: A video taken at Maryborough St house fire. UPDATE SUNDAY 9.20AM: "It will be next to impossible to find the cause" of the fire which destroyed a Maryborough St house. 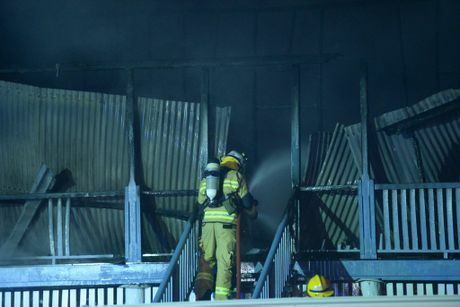 A Queensland Fire Service spokesman said because the structure was a total loss and it would be unsafe to enter and the likelihood of finding the cause at this stage was slim. 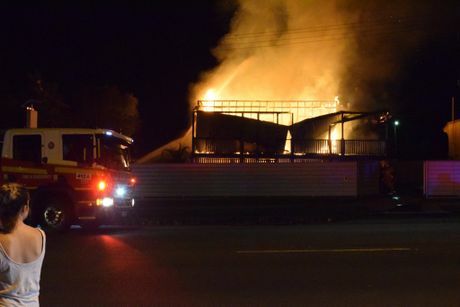 UPDATE 9.10PM: Wide Bay QAS senior supervisor Martin Kelly said no one was injured in the fire, which destroyed a two-storey backpacker accommodation. "Most of our work is about making sure the firies are okay," he said. Neighbours at the scene told the NewsMail they believe a fire alarm alerted the occupants who managed to flee the burning house. Police continue to investigate the cause of the fire. UPDATE 8.40PM: A witness at the scene of the Maryborough St fire said the heat was so intense she couldn't get anywhere near the house. Gaydee Nixon who lives two doors up from the double storey Queenslander that burnt to the ground was out the back when she heard a popping noise. Ms Nixon ran out to the front of her house to see flames bursting through the roof of the neighbouring property. She called out to her niece to call 000 while she went to see if everyone was okay. "It was that hot I couldn't get close," Ms Nixon said. "I have never seen a house go up so fast. "It went up in about 3 minutes." Ms Nixon said she found the occupants of the home, five Asian backpackers, and they were unharmed. "They were okay, a bit shaken up and a bit upset." Ms Nixon said she heard the fire may have been started by a universal adapter plugged into a wall socket. Another nearby resident Ingrid Rieder said she was alerted to the fire by the smell of smoke. "The roof caved first, it went up that quick," Ms Rieder said. Firefighters are still at the scene of the inferno. 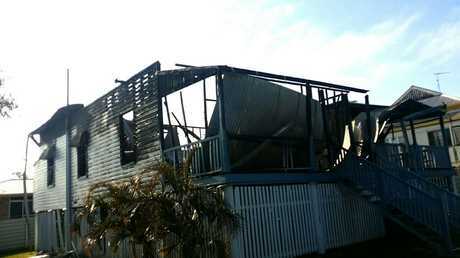 EARLIER: A two-storey Bundaberg house has been destroyed after a fierce blaze broke out. The fire started just before 7pm at Maryborough St near Hinkler Central with witnesses claiming flames were seen up to 30m in the air. Neighbours said the Queenslander was a budget backpacker accommodation. 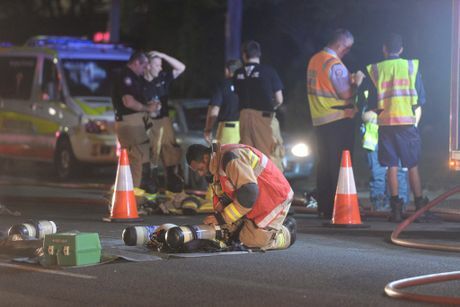 The NewsMail has been unable to confirm if there have been any injuries.